For its spring exhibition, Display dedicates its space to the artist Valentin Dommanget, known for the Digital Stretcher Studies series, paintings on distorted canvas under the blows of manipulated software or for his last show How to Make an Exhibition. By applying the vocabulary of 3D universes to the poetics of painting and the process of exhibition, the intervention in the space spotlights an undefined zone at the center of the investigation. There is an exhibition that takes on the shapes of its own digital representations. A virtual tour translated into reality, with its proportions, distortions, hijacking and glitches, unfolding and multiplying the versions of a same space. 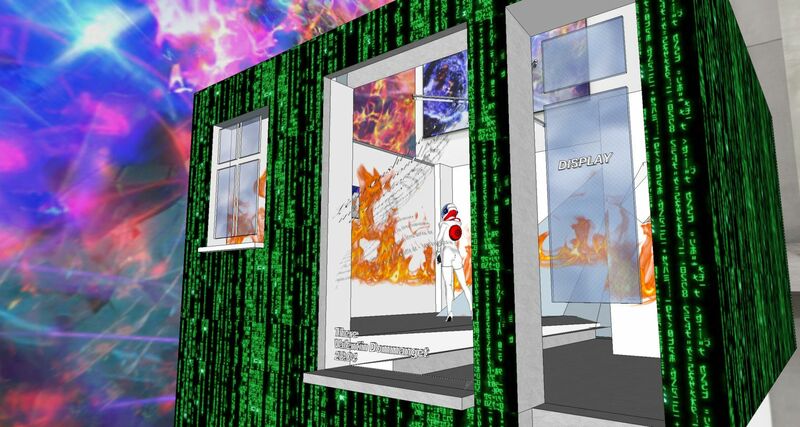 The illusion of spatiality, given by the 3D modeling, is directly transferred to the physical space of the gallery through Augmented Virtuality, leveling any differentiation, or merging real and virtual universes. There is an attempt to reveal and extrapolate the presence of the wireless in our sensorial environment and its impact on our daily lives and bodies. You enter Display. You are There. You are invited to experiment this oscillatory space and collect some of its infinite variations.